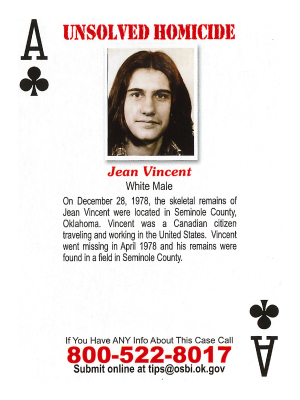 On December 28, 1978, the skeletal remains of Jean Vincent were located in Seminole County, Oklahoma. Vincent was a Canadian citizen traveling and working in the United States. Vincent went missing in April 1978 and his remains were found in a field in Seminole County.